I was born in Reconquista, a city of Santa Fe province in Argentina. I come from a simple family, and was brought up by my grandparents, aunts, and uncles. In my youth I was always involved in parish groups. I was 27 years old when, thanks to Laura Miguel, a friend who has since died, I began to take seriously my desire to follow Jesus among the poorest in society. In a conversation one day with some friends, Laura told me: “You have a religious vocation.” At that moment I told her she was crazy, but the question had broken forth in my being. That is how I began my search and my journey. In 2003 I got to know the RSCJ in Reconquista and began an accompaniment process with Ana María Gallart rscj. Those words are imprinted in my heart, to be forever remembered. Following this accompaniment and discernment, in 2005 I began my journey with the Religious of the Sacred Heart in Buenos Aires. I am still on that journey, currently living in the Guadalupe community in Salto, Uruguay. I lived in various communities over the years: Villa Jardín; Ituzaingó for my Nazareth formation (“novitiate”); then back to Villa Jardín in 2008 after my first vows; and from there to Reconquista, my home ground. Today, I am in Salto,Uruguay, where I have recently arrived…. I come.… following in the footsteps of other Sisters who have offered their lives in this land. *** This profile was written in November 2016. 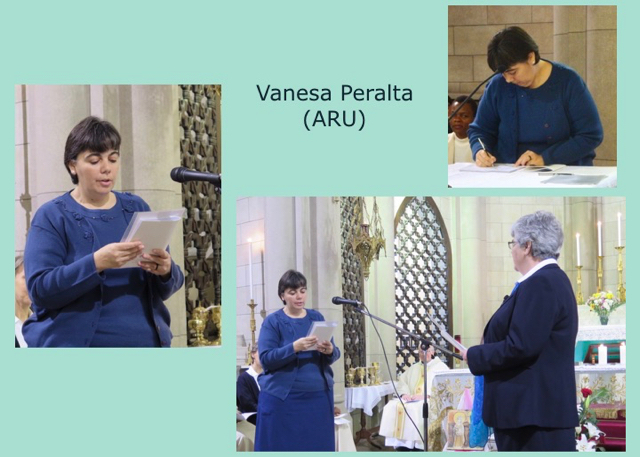 Two years later, on the 28th of January 2018, Vanesa made her final vows as a Religious of the Sacred Heart.